KARL MAYER has been operating successfully on the Turkish market for many years now, so that it is imperative for this company to exhibit at the ITM trade fair being held from 14 to 17 April 2018 in Istanbul. 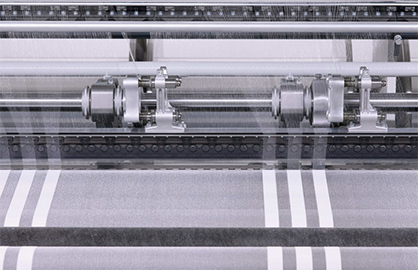 This manufacturer is exhibiting in hall 7, stand 709 at this international textile machinery fair as an innovative partner in the warp knitting and warp preparation sectors, and one which can offer leading brands many new ideas and concepts. Net curtains are the focus of KARL MAYER’s machine presentation at the ITM exhibition – and this is proving to be a great success. “Warp-knitted net curtains are still strong in Turkey. The number of our customers focusing on the production of warp-knitted net curtains and embroidery grounds is increasing all the time,” says Roland Kunze, the Managing Director of KARL MAYER’s agent, ERKO. The company’s customers are extremely imaginative and are always on the lookout for something new. And they are definitely not being disappointed in KARL MAYER. The HKS 3-M on show at the ITM fair is producing a new, lightweight voile fabric with striking shimmering effects in the ground and a striped design in a gauge of E 28. The patterns produced on the HKS 4-M EL, equipped with one more guide bar and EL control, are illustrating the types of designs can be produced for the outerwear market. The lightweight, semi-transparent designs have a striking lace-like appearance. 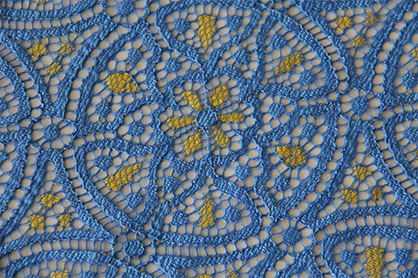 Symmetrical patterns are placed on filigree, tulle-like grounds having a subtle shimmer, which is highlighted effectively by the textured effects of the yarns used. The EL control facility enables a wide variety of motif shapes and virtually unlimited repeat lengths to be worked. Another focal point for the fashion sector is the stylish lace designs produced by the LACE. EXPRESS. Roland Kunze is certain that, “We are opening up new market opportunities for lace producers with the OJ 83/1 B especially - a machine that has a particularly advantageous cost:benefit ratio,” and he is looking forward to receiving many enquiries. KARL MAYER is an expert in warp preparation for the denim sector. The company is showcasing a LONG CHAIN BEAMER (Fig. 5) and a BALL WARPER for use in the production of jeans. A PRODYE indigo dyeing machine and DOUBLE VARIO dyeing unit are also on show. Together with warp knitting and warp preparation, technical textiles are the third focal point of KARL MAYER’s show. The company is exhibiting as an experienced partner to the composites sector, and is offering machines for producing concrete reinforcement – textile concrete being the buzzword here – and the construction sector. And the company is also bringing fashion into the mix. 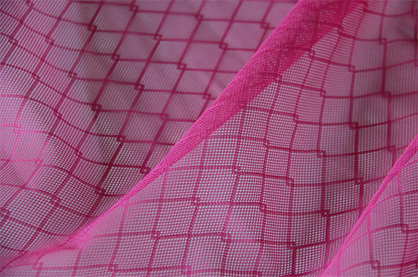 Lightweight, stylish, weft-inserted warp knits can be produced on the WEFTTRONIC® II HKS and used in remarkable clothing collections.